Editor and rabbi of Leghorn, Italy; died there about 1815; son of Isaac Joseph Nuñez-Vaes, and pupil of Isaac Nuñez Belmonte. David b. Raphael Meldola wrote an elegy in his memory (Leghorn, 1815). 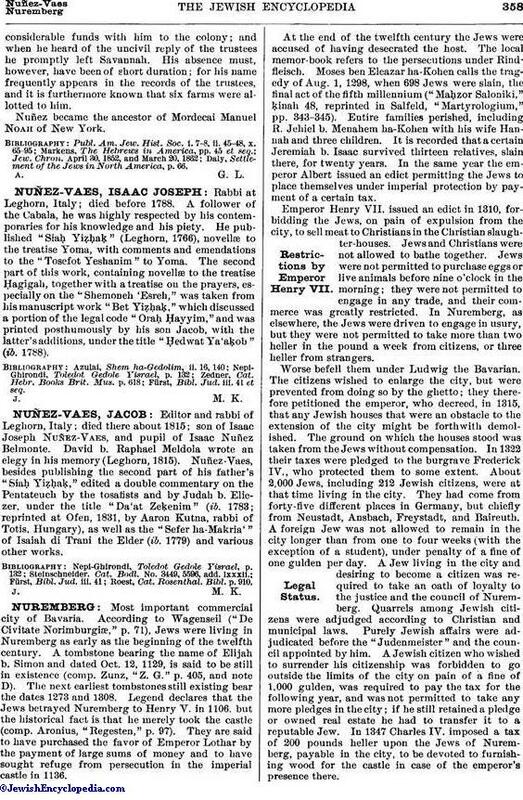 Nuñez-Vaes, besides publishing the second part of his father's "Siaḥ Yiẓḥaḳ," edited a double commentary on the Pentateuch by the tosafists and by Judah b. Eliezer, under the title "Da'at Zeḳenim" (ib. 1783; reprinted at Ofen, 1831, by Aaron Kutna, rabbi of Totis, Hungary), as well as the "Sefer ha-Makria'" of Isaiah di Trani the Elder (ib. 1779) and various other works. Roest, Cat. Rosenthal. Bibl. p. 910.